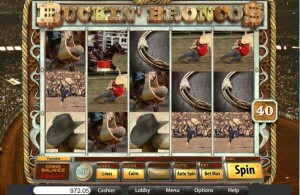 Buckin Broncos is an original game, thanks to the theme it uses, which I for one haven’t seen in any other slot machine so far. It is themed around rodeos and riding wild horses and bulls for show, something that people still do in certain parts of United States, especially in the south. 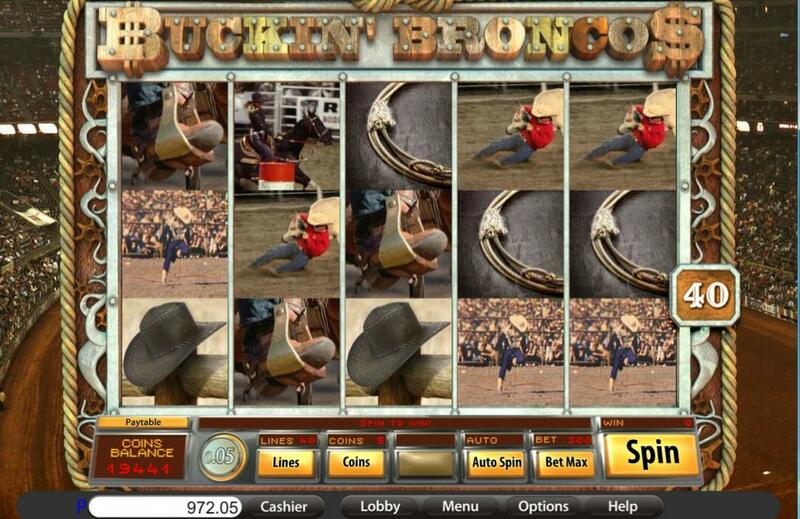 You can see the cowboys that are riding broncos in the symbols of the slot, which seem to use real vintage photos instead of hand drawn images. The game was created by Saucify (former BetOnSoft). You get lots of chances to win big in Buckin Broncos, the game having 40 paylines total on its 5 reels. The list of features starts with the wild and continues with scatter symbols, multipliers and free games. You can win a top payout of $7,500. The two symbols that are used by Buckin Broncos are the scatter and the wild. Each one has its own role to play in the game, either used as a substitute or being a trigger for free spins with multipliers. The Bull Rider symbol is the one that is considered the wild feature of the game. Like all wilds, the thing that makes it special is the ability it has to take the place of other symbols, though of course it first needs to land on the right payline first, and the rest of the combo’s symbols need to be in place as well. The wild substitutes for regular icons only. If you happen to get extremely lucky and you get a combo formed out of wilds only, you can get paid up to 6,000x. The other major symbol is the scatter, which will pay you between 2 and 120 times the total bet if you get three to five icons of this type, anywhere on the reels. The Timer, which is the scatter I mentioned above, will also be responsible for getting you into free spins mode. Have three Timer icons present, and your reward will be 7 free spins and a multiplier of 2x. 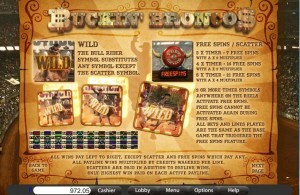 With four Timers, the reward is 14 free spins and a bigger multiplier, now at 3x. The maximum number of free spins is 21, with a 4x multiplier, and you need to have all five Timer scatters on the reels to get them. 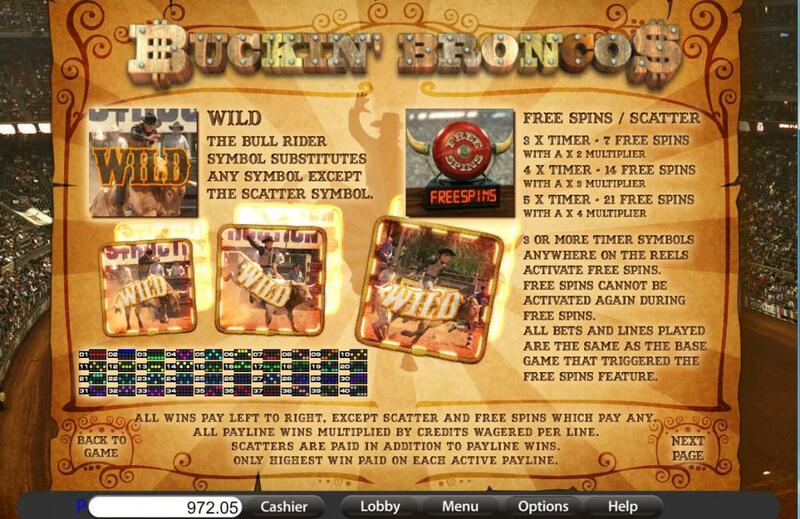 You may retrigger the free spins, as long as you land once again 3+ scattered Timers on the reels. The slot has 40 lines, so you can expect the wagers to be higher than average. The slot requires up to $50 each round, but you can get away with considerably less if the budget is too small. You can spend up to $1.25 per line, using 1 to 5 coins, with denominations reaching $0.25. As for the top payouts offered, they’re at 6,000x and their maximum value would be $7,500. The theme of the game is unusual enough for this industry, but I’m glad that they covered it. The background will show you a huge arena where the rodeo tournament is taking place, with thousands of people attending in the stands. The reels have a surrounding area that is made out of wood, rope and metal spurs, while the symbols will show you photos of the events at the rodeo. Symbols: Bull Rider (wild, 6,000x), Timer (scatter, 120x the bet), Buckin Bronco (3,000x), Rider without horse (1,600x), Horse Rider (1,000x), Red Shirt Man (600x), Man in Rodeo (300x), Clown Face (200x), Hat (100x), Boot (60x) and Rope (50x). It’s got a theme which will have plenty of fans. Not sure the retro angle worked for the design of this game, with the real photos, but it’s still the only game I know of to have this theme. 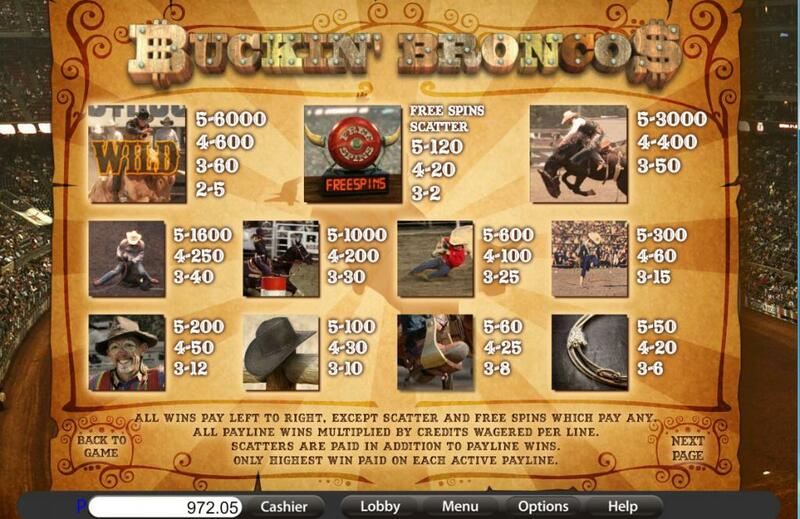 Buckin Broncos can be found at any Saucify casino, where you get a chance to play it for real money or in free mode.